When you think of the crème of the crop in UK online betting, you think of William Hill. Boasting the tag of UK’s top betting website, William Hill has satisfied bettors of a wide range of interests for quite some time now. In fact, WH has grown to become one of the most trusted betting operators in the betting communities across Great Britain. With the support of William Hill Betting’s online platform, you can place bets on just about any kind of sport, if sport betting is something that piques your interest. Among the categories of sports they have on offer, golf is a rather popular one. William Hill is widely regarded as one of the most reliable golf betting websites in the world. In this article, you will be learning the reasons for which William Hill is considered as one of the leaders of worldwide online golf betting. Let us first start off with the William Hill golf betting rules. Unlike a lot of other websites where it can be quite difficult to locate the specific rules that you are supposed to follow while placing your bets on golf matches, the William Hill Betting website has a wonderful help centre that offers information on a plethora of topics. Their information on general golf betting rules is one of the fines educational materials that you will come across in any sports betting website, let alone a general betting website like William Hill. Everything that you need to know about golf betting can be found in the William Hill Betting website. The information is easy to access and even easier to comprehend. For your convenience, this article contains some of the fundamental rules of golf betting according to William Hill Betting. When tournaments are affected by adverse weather, play can cease for hours. A huge amount of play time is lost that cannot be recovered since all tournaments are organized on a tight, inflexible schedule. There is limited time for golfers to go out in the greens and perform. As a result, the number of rounds that were originally scheduled to be played is reduced by the tournament’s governing body. In such cases, the outright bets that were placed by the players will be settled on the basis of the official result that has been announced by the tournament authority. The number of rounds of play is not taken into account. If a player is awarded with the winner’s trophy, even if there is no play after the weather interference, the bets will be won on the basis of the official outcome. A player will be considered a participant in the tournament or any match once they have teed off. If the player is withdrawn from the game for any particular reason, the stakes on the player will be lost on outright, group, match and 18 hole betting. Although golf if primarily a single person’s game, it is not always about the individuals. In special tournaments such as the Ryder Cup, we see teams competing against one another in a game of golf. In golf betting, there are often no prizes offered for a draw in team golf. If the match ends up being a draw, all the bets placed on the two teams will be considered void. In outright betting, the bettor has to make a prediction on the ultimate outcome of the golfing tournament. This is done by naming the person who the bettor thinks will win the tournament and walk away with the cash prize. If the bettor’s predictions are spot on, he or she too can walk away along with the golfer with the prize. In the case of a player withdrawing before the start of a tournament, refunds will be handed out as the Tattersall’s Rule 4 Deduction is applied to winning bets. The refund rule is not applicable in the case of a player being withdrawn from the tournament after the tournament is underway. Under such circumstances, all bets placed on the player will be lost. 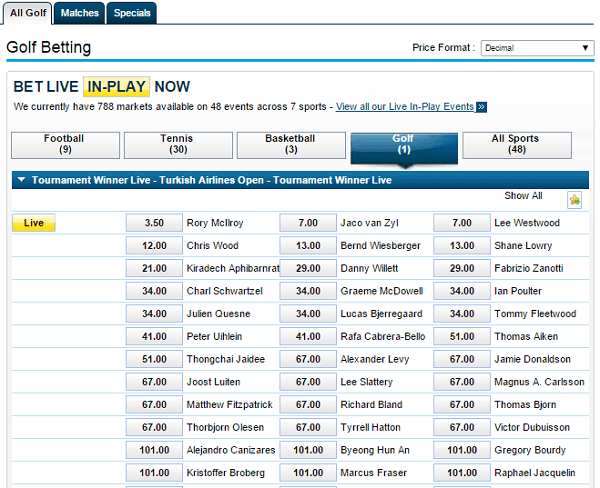 Tournament match betting is fairly simple. You have to predict which player will have the highest placing at the closure of the tournament. If a player has missed the cut, the other one is considered to be the winner. In the case that both the players miss out on the opportunity, the player with the lowest score after the cut has been made will result in settlement. If the two selected players fail to qualify for the next round and exit the tournament at a particular round, the player who has acquired the lowest score from the earlier round is deemed as the winner. In addition to these rules, you must also bear in mind that the disqualification of one player results in the victory of the other. In the case that both players are disqualified, the player with the greatest progress in the tournament is deemed as the winner. The simple, uncomplicated and easy to implement William Hill golf betting rules are the not the only things that make this website perfect for online golf betting. You can enjoy William Hill’s exclusive podcast on golf. The podcast is available for download on iTunes. Hosted by Dave Kelner and Mike Grenham, this podcast will keep you supplied with your weekly dose of news on all the latest golfing action from around the world. 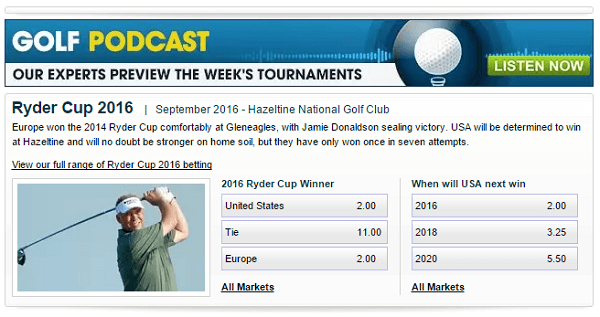 You can also hear Jamie Spence weighing in on the best bets to make for the majors and the European tour. A new podcast episode is released every Wednesday. Needless to say, the William Hill golf betting podcast is a can’t miss attraction. It is a well known fact that William Hill Betting has some of the best odds to offer on golf betting. In fact, their sports betting odds in general are extremely lucrative. Finding odds on the William Hill website is not at all a difficult task. These are readily available on their golfing section of the website. The William Hill golf betting odds are highlighted in long detailed lists to ensure that the bettors are well informed about all the chances that they would have to take to win a bet.